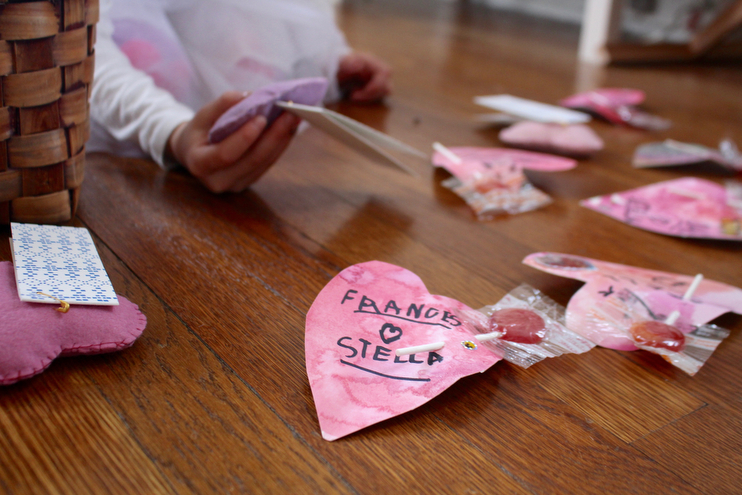 My darling girl woke up early this morning and finished the last of her Valentine’s, each asymmetrical, hand-painted heart proudly signed in black ink with “STELLA” in uppercase letters. She poked holes in the hearts, added suckers, and then a few butterfly stickers for good measure. 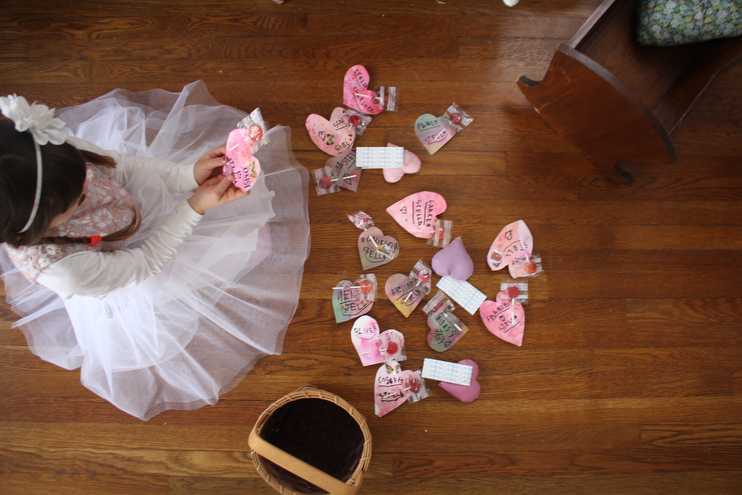 I added notes and pinned them onto the felt heart sachets for her teachers and helpers and found a basket for her goodies. She then she put on the fluffiest, fanciest dress she could find in her closet and asked for two braids. I made a heart sandwich for her to take for lunch. She was beaming. 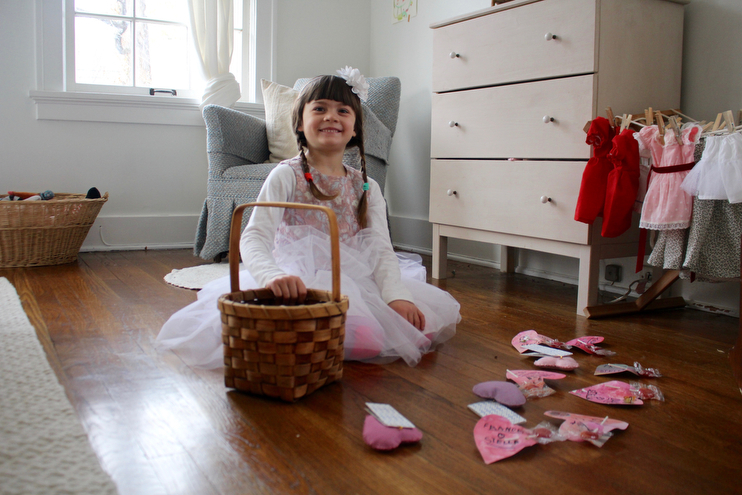 For Stella, Valentine’s Day is like every other day except everything is pink and red and sparkly and sugary. It’s every girl’s dream. It used to be mine, as it’s also my half birthday. And as much as I love how wonderful almost every holiday is when you have little ones to celebrate with, I cannot help but think about love and this holiday in a different way as a wife and now mother of three. It has changed and grown profoundly over the years. Yes, roses are red and violets are blue, but love…love when you’re all grown up is altogether something else. It’s about beginnings and endings and all those translucent layers mashed up in between that you keep going back to, despite the hard work involved. Love is a pile of laundry sitting in the corner waiting to be folded. It’s warm mug pf coffee on his side of the bed steaming as the sun rises. It’s noticing. It’s pulling and tugging pants up six little legs before pulling up your own before church. It’s the smiles you offer when you’d rather feel like sleeping. Love is for children who remind us the importance of being present, for husbands who shine a light on our truths and then kiss our insecurities, for friends who challenge and keep us warm, and for family, who through it all simply remain. Love is persistence and showing up. It’s asking forgiveness. It’s forgiving. It’s more than a old poem, more than a sturdy string of words, although I suppose they do help frame things up when feelings spill over and you find yourself left with nothing but the hard work others have put into describing how love and their loved ones have shaped their lives. There is so much I could say about love, so much you could too, so much so, that sometimes it’s better to let others do the speaking. I love this particular poem from Mary Oliver’s book Felicity – her latest and greatest collection about love in the second half of her life. It’s doesn’t scream, “Hearts and cards and chocolate and kisses and smoochy loooove!” Not even close. But it’s love alright, in solid Oliver fashion surrounded by nature and birds that show up every spring. There’s currant of understanding in the words that she writes, that love requires work and paying attention and a never-ending trial of learning and leaning into “new ways to love”. I woke up this morning a grump and asked my husband later on if “we could start over?” I overslept and was altogether short and a bit sour. It was hard for me to wade through my stubbornness to get there, but I arrived. Love is persisting and saying I am here, I see you, I hear you, I feel you, and more than anything else I want to keep doing life together. And the two of us, together – a part of it. To read more about one of my favorite poets and her collection of love poems head here and if you care to hear her speak with Krista Tippet about how to listen to the world, head here. Happy love day to you, today and everyday.